LOCATION.--Lat 40`09'04", long 76`41'22", Dauphin County, Hydrologic Unit 02050305, along Hillsdale Road on right bank, at bridge at the intersection Hillsdale Road and Saw Mill Road, 2.5 miles from confluence with Susquehana River at Falmouth, 5.8 miles from Middletown, PA.
PERIOD OF RECORD.--June 2011 to current year. GAGE.--Water-stage recorder, crest-stage gage, water quality sensor, and non-heated tipping bucket precipitation gage. Satellite telemetry at site. Datum of gage is 310 ft above National Geodetic Vertical Datum of 1929, from topographic map. 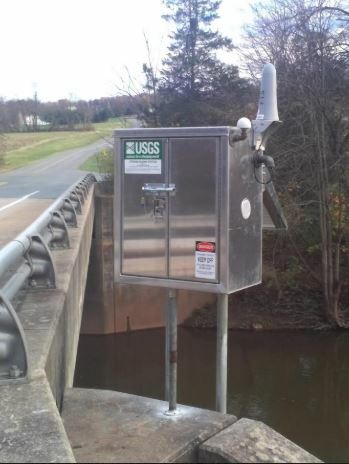 On November 14, 2018, the gage was relocated 0.3 miles upstream. Gage heights will be about 2.3 ft higher than before the gage was moved. COOPERATION.--Funding is provided by the Pennsylvania Department of Environmental Protection as part of a water-quality assessment of the Conewago Creek Watershed.